Memories of that August day in 1971 had faded from my mind until I found this picture recently as I have been sorting through our family pictures. I would have been 6 years old when we spent a couple days at the Clark family cottage. Dad took me out on my first fishing trip. I recalled how proud I was of the string of fish we caught and how big they seemed. The picture reveals the reality of size, but none the less my father cleaned them and mother cooked them for dinner (I truest adding more to the diet for the night). 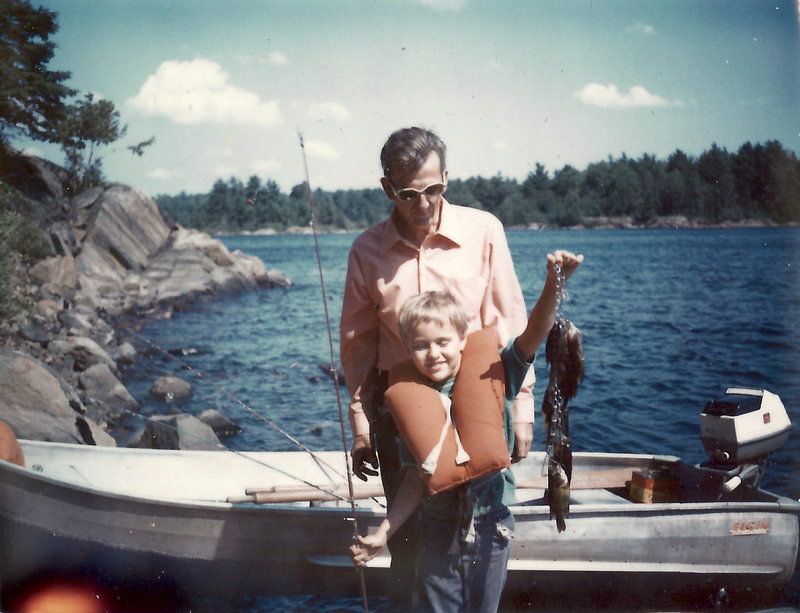 My father truly enjoyed going fishing, a pastime I have never come to share. For years he tried to teach me on our annual trips to Manitoulin Island. Soon I found other things to do and dad ventured out on his own. He never caught much, and I have realized what he sought was less fish than the peace the time spent on the water afforded him. When I went out in the boat I enjoyed the trip, playing with the boat on the water and going place we had not before gone. Dad would go out and let the boat drift, often for more than an hour before repositioning it and going adrift once again. He would come in after hours, more often than not empty handed, but always more relaxed. I didn’t much understand but I knew he enjoyed the time. Today Part of me wishes we had shared the time together, who knows what would have been said. The other part now understands what those times truly meant for him. Wherever he now is I suspect he finds some time adrift, rod in hand; at least that is my hope. This entry was posted in 1970's, Gordon Olivant, Harold Olivant, Vacations and tagged Gordon Olivant, Harold Olivant. No. Under no circumstances may you use this, or any other photograph from my blogs. As stated they are subject to full copyright protection. Any use or unauthorized reproduction will result in legal action and take down notices for any material including the copyright protected material under the Digital Millenium Copyright Act. This is peraonal material for for any reproduction.